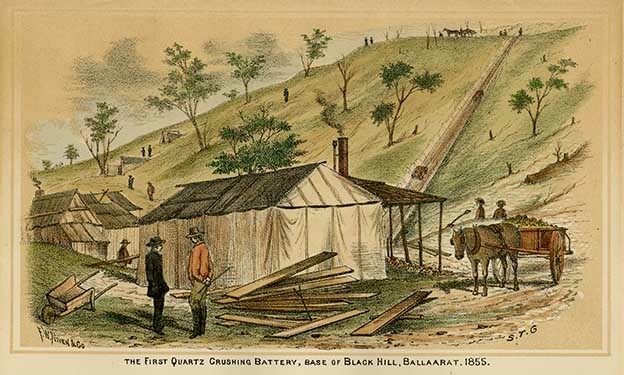 Samuel Thomas Gill, First Quartz crushing Battery, Base of Black Hill, Ballaarat. 1855, colour lithograph. Art Gallery of Ballarat, gift of Dr. Philip Moulton, 2004. 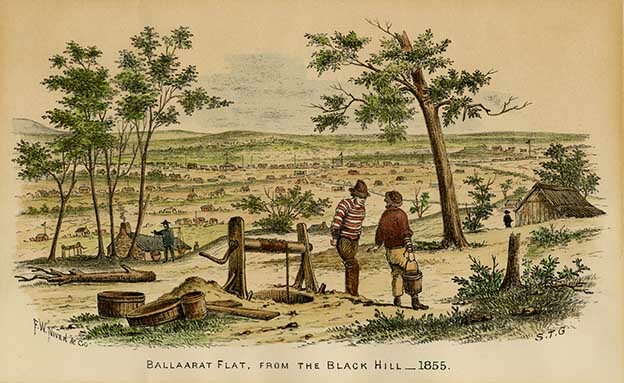 Samuel Thomas Gill, Ballaarat Flat, from the Black Hill - 1855, lithograph on paper. 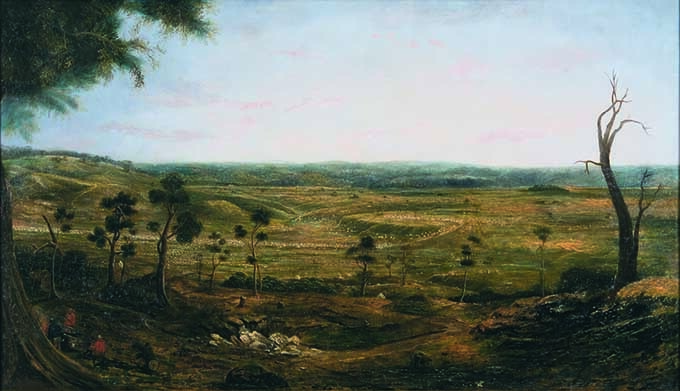 William Duke, View From Black Hill of early Ballarat and diggings, c1853, oil on canvas. The order to fall in and be silent was given, and when Captain Thomas had spoken a few words we were put in motion, led by Captain Wise. The party had not advanced three hundred yards before we were seen by the rebel sentry who fired, not at our party, but to warn his party in the Stockade. he was on Black Hill. A long letter, dated February 7, 1870, and signed "John Neill, late of the 40th Regiment," describing the attack on the Stockade, and some of the immediately subsequent events gives the point of view of a soldier who took part in them. "When within a short distance of the Stockade the insurgents fired. Captain Wise fell, mortally wounded. The same volley wounded the lieutenant of the. 12th. already spoken of, and three of his men; two killed, one wounded of the 40th—Privates Michael Roney, Joseph Wall, killed; William Juniper, badly wounded The camp officer says the police were the first to enter the Stockade. He is wrong. There was not one policeman killed or wounded during the whole affair. When Captain Wise fell the men cheered, and were over in the Stockade in a second, and then bayonet and pike went to work. The diggers fought well and fierce, not a word spoke on either side until all was over. The blacksmith who made the pikes was killed by Lieut. Richards, 40th Regiment. Honor to his name; he fought well and died gloriously. It was rumored that at that time the police were cruel to the wounded and prisoners. No such thing. The police did nothing but their duty, and they did it well for men who were not accustomed to scenes of blood or violence- To my knowledge there was only one wounded man despatched, and he kept swinging his pike about his head as he sat on the ground. His two legs were broken, and he had a musket ball in his bcdy. He could not live, and it was best to despatch him. His name was O'Neill, a native of Kilkenny, Ireland. I heard this statement from a sergeant of police, and I knew it was correct." ↑ Ian D. Clark, Another Side of Eureka - the Aboriginal presence on the Ballarat goldfields in 1854- Were Aboriginal people involved in the Eureka Rebellion?, University of Ballarat, 2007. ↑ THe World's News, 06 August 1930. This page was last edited on 10 August 2017, at 14:29.